Eight years ago, in the largest environmental disaster in U.S. history, BP's exploratory Deepwater Horizon oil rig exploded. Millions of gallons of oil gushed into the Gulf of Mexico, and the world watched failed attempt after failed attempt to contain the blow-out. Eleven people died and it took 87 days to stop the spilling well. This resulted in a loss of 10 million user-days of beach visits, fishing and boating. Since then, safety standards have not been improved in any meaningful way. In fact, the Trump administration is working to roll back the handful of safeguards that were put in place as a result of the disaster. The Gulf's marine ecosystem continues to suffer even today. Years after the spill, whales and dolphins continued to die at higher rates and experienced diminished reproductive success. Heart-breaking images of oil-soaked birds and sick and dead sea turtles make clear that this is not a risk we should bring to any new areas. But that is exactly what is being proposed. If the Trump administration has its way, dangerous new oil and gas exploration could soon begin along the Atlantic coast. 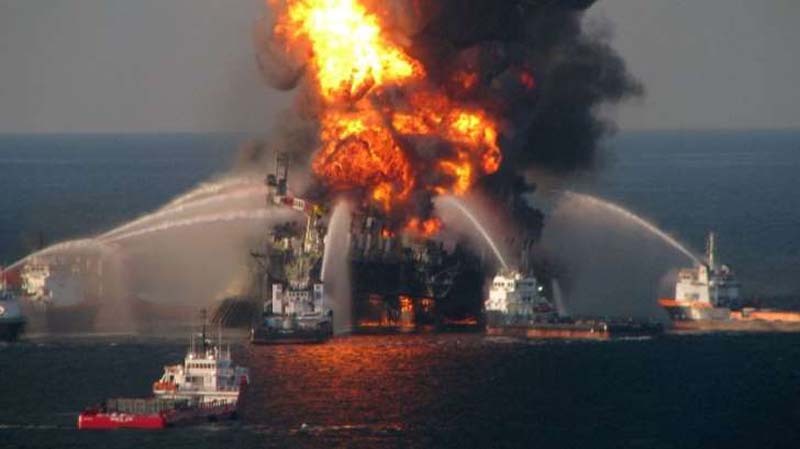 Few may realize that the BP Deepwater Horizon rig was tapping an exploration well when it exploded. The distressing scenes from the Gulf disaster were only the most visible effects in a years-long series of assaults on the marine environment. Harmful exploration activities begin with seismic airgun blasting - ships towing miles-long arrays of seismic airguns and related equipment pummeling the ocean with very loud explosions of air that are used to search for potential oil deposits below the seafloor. The blasting is repeated every 10-12 seconds, 24 hours a day, for up to a year. Once the blasting starts, the damage begins. According to the government's own estimates, marine mammals that use sound to communicate and navigate under water could be harassed or harmed hundreds of thousands of times if these activities go forward. Studies have also shown that seismic airgun blasting can kill zooplankton, damage shellfish larvae and alter fish behavior -potentially reducing catch rates of some species by 50 percent or more. That is why all three East Coast fishery management councils and numerous recreational and commercial fishing associations have voiced opposition to seismic airgun blasting. And, seismic airgun blasting only identifies potential oil and gas deposits; exploratory wells like the BP Deepwater Horizon Macondo well are required to definitively confirm the presence of oil and its commercial viability. Between the disruptive and dangerous seismic airgun blasting and the potentially disastrous exploratory test wells - oil and gas exploration on its own is a grave threat to the thriving tourism, fishing and recreation economies that depend on a clean, healthy coastal ecosystem. If oil is found, even more drilling follows, and more exploration, followed by the industrialization of the coast as beach towns begin their transformation into oil towns. Some have argued that "we should just see what's out there," but this sentiment is either misinformed or disingenuous. Seismic companies sell their proprietary information to oil companies for millions of dollars, and, under current law, they won't have to share it with coastal state governments. The information remains private for 25 years. This doesn't have to happen. Indeed, the Obama administration concluded that the "value of obtaining the geophysical and geological information from new airgun seismic surveys in the Atlantic does not outweigh the potential risks of those surveys' acoustic pulse impacts on marine life." Over 200 municipalities; hundreds of local, state, and federal lawmakers; tens of thousands of small businesses and fishing families; and millions of citizens made sure that the Obama administration heard their voices, and ultimately, they succeeded. Based on this wave of opposition, as well as the scientific evidence of the risks involved, the previous administration removed the Atlantic from the five-year plan and denied permits for seismic airgun blasting and dangerous exploration. It's time for President Trump and Interior Secretary Zinke to follow suit. If the administration approves dangerous exploration with seismic airguns, it is ignoring the people on the coast, ignoring the evidence that demonstrates the great harm this will cause to marine ecosystems and coastal economies, and is ignoring its mandate to responsibly protect and manage our nation's natural resources. Eight years ago, we saw just how disastrous oil and gas exploration truly is. Trump and Zinke should reverse course on their dangerous exploration and offshore drilling plans. Diane Hoskins is the campaign director at Oceana, an international ocean advocacy organization established in 2001 by The Pew Charitable Trusts, Oak Foundation, Marisla Foundation (formerly Homeland Foundation), and the Rockefeller Brothers Fund.